Steven Greene is working as a System administrator at Universal Containers (UC). 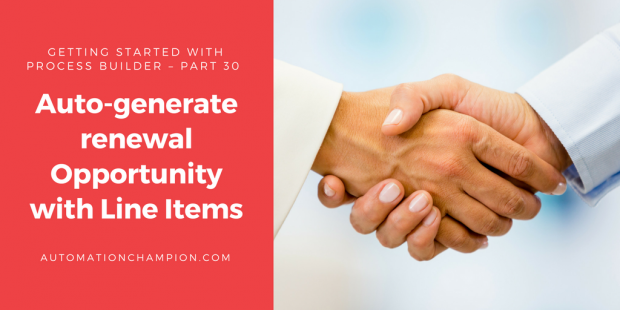 He has received a requirement from the management, to auto create/generate a new Opportunity with opportunity line items based on the close date of an existing opportunity. 2. Click on New Flow, it will open the Flow canvas for you. Now create few Text variables VarT_AccountId, VarT_OldOpportunityId, VarT_NewOpportunityId, VarT_PricebookId and VarT_OldOpportunityName to store the Account Id, old Opportunity Id, new Opportunity Id, existing Opportunity Price Book Id and old Opportunity Name respectively. 5. Save your flow with name Auto-generate renewal Opportunity WIth OLI and close the canvas. Don’t forget to Activate the Flow. Note: – I will suggest you to implement this first on your developer org, test it and then move it to production. Don’t try to implement this in Spring’15 org, otherwise, you will get an error. I have never found any apps or out of the box solution to add a Topic to multiple records. In this article we will develop an app for similar functionality without using code. People in Universal Container are using Topics to organize records. 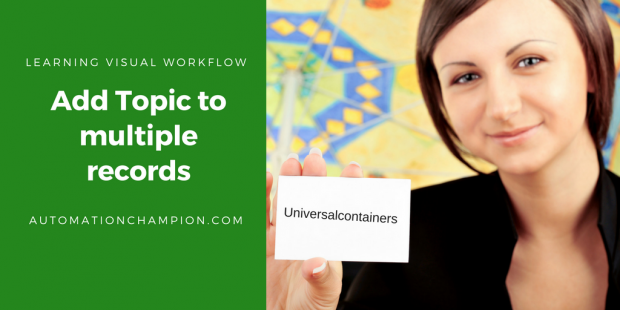 Management in Universal Container wants to develop an application so that their business users can add a topic to multiple records without navigating screen to screen. In this demo I will add Topic to all Opportunity records based on Their AccountID. For example add topic Universalcontainer to all opportunity records those belongings to Account “Universal Containers“. To solve above business requirement we will use Visual Workflow and to fire this flow will use Custom Link. Before going ahead with the solution you have to understand about TopicAssignment and Topic Object. 13) Save the flow with name Add Topics To Multiple Records and close the canvas.